Right off the bat, I have to say that Benny Andersson’s Piano has been a very happy and surprising discovery. One of the founders of ABBA, this twenty-one track album spans Andersson’s career and includes solo piano arrangements of music from his musicals, ABBA songs, and other music he has created over the years. Released on the classical Deutsche Grammophon label, I knew that this wouldn’t be a pop music album, but I’m still amazed and delighted at just how classical it is. None of ABBA’s biggest hits are included in this collection (it isn’t a solo piano retrospective of ABBA’s music, but of Andersson’s), but what a beautiful recording it is! Some of the music hints at other classical composers, but these are only hints and the music is unique unto itself. I think the biggest surprise for me was what an accomplished pianist Andersson is. Most of this music is not showy or virtuosic, but Andersson’s playing is confident, expressive and very colorful. I had a long road trip very recently and took a stack of CDs with me that I needed to review. Piano was such good company that I listened to it four times on the trip and couldn’t wait to hear it again. With twenty-one tracks, the album is a very generous hour and eighteen minutes, so you get more than your money’s worth with this one! 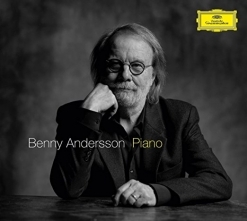 I’m sure that Piano will be one of my favorite albums of the year and I hope Benny Andersson will produce more music of this nature in the near-future! Piano is available from Amazon and iTunes as well as other retail outlets. I give it my highest recommendation!